Download the conference schedule pdf here. 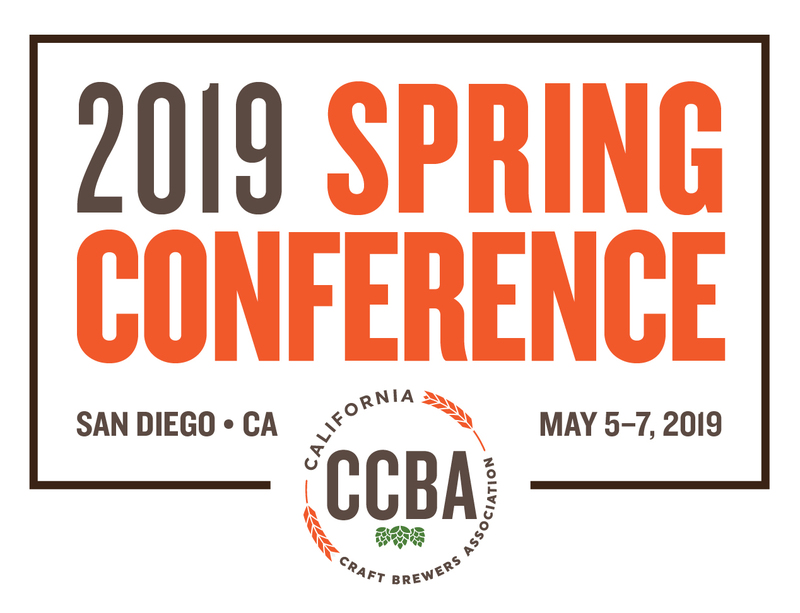 The California Craft Brewers Association is offering a fun and educational way for Spring Conference attendees to travel through the San Diego area, visit local breweries and sample some great craft beer produced in the region. Brewery Stops include: AleSmith, Bitter Brothers, and Karl Strauss Join CCBA for a tour of three well-known San Diego County breweries. The tour starts in front of the Hilton San Diego Resort & Spa at 1pm on Sunday, May 5 and will travel to three breweries for fun and educational tours. Join CCBA staff, conference attendees, speakers, and sponsors at the Sunday Welcome Reception. Attendees must be 21 years old or older to register and participate. Shuttle buses will transport attendees from the Hilton San Diego Resort & Spa to the Stone Liberty Station beginning at 5:15pm. For fast check in please BRING YOUR CONFERENCE BADGE to the reception. Badges can be picked up at the Hilton San Diego at registration from 11am-5:30pm on Sunday, May 5. Challenges, coalitions and changes in the industry all impact policy discussions at the State Capitol. The CCBA's Government Affairs team is highly engaged throughout the legislative process - speaking with a unified voice on behalf of the California craft brewing industry. Get the rundown on CCBA's legislative activity during the 2019 session, new laws impacting the alcohol beverage industry and an overview of what the association expects in the year ahead. Projections, strategy and planning for financial needs over time. The most important function of any brewery is the production and release of brands that are both free of defects and consistent with their intended flavor profile. This objective requires the application of robust quality assurance methods, but many small craft breweries see their lack of time, money and expertise as insurmountable barriers-to-entry preventing them from building their ideal quality assurance program. Rapid Sensory QC methods will be presented to highlight how the brewing industry can successfully circumvent these common challenges and build a sustainable sensory program. Every brewery starts with making great beer and connecting to consumers, but what do you need to pay attention to as your business expenses grow year over year? Where can you be more efficient with your dollars and your resources? How should you assess risk while remaining fiscally responsible? Join this panel discussion to participate in a candid discussion about business best practices. Cambria Griffih, Figueroa Mountain Brewing Co.
A marketing plan is a critical piece of any business. As craft brewers, we often find ourselves short on the time, capital, and customization that we need. Set yourself up for success and efficiency with a toolbox specifically curated to build a craft beer marketing system that works. Your size, budget, and growth model may change, but a strong foundation today will let you build an even better tomorrow. In this seminar participants will be provided with information regarding priority environmental compliance issues confronting the craft brewing industry. The participants will receive information regarding various environmental, health, and safety regulatory requirements with a discussion of critical compliance issues, practical potential strategies to address them, and a long term forecast of the future regulatory climate. Participants will be given an opportunity to ask questions regarding specific compliance issues they are dealing with. Fragmentation in US beer, ushered in by craft, only seems to be picking up speed, creating pockets of growth and contributing to tougher trends all at once. Craft keeps rollin’ but fractures further as new coalitions form, and old lines are redrawn or obliterated. By way of Newton’s three laws of motion, this up-tempo overview of the total beer industry and craft’s shifting place within it will dive deep into the latest data and news developments. Moderator: Jim Woods, Woods Beer Co. This presentation will discuss yeast handling specific for craft brewers. We will discuss the different methods and best practices of each method and some ideas on how you can implement this in your own brewery. Join Seismic Brewing Co. and Moss Adams to review specifically how ERP can serve as the single software solution that manages your brewery-based business. This case study review and Q&A session will give your brewery thoughtful recommendations for software integrations at your brewery. How Has “Craft” Impacted the Beverage Industry? Join a panel of beverage industry experts from wine, spirits and NA to discuss what can be learned from craft’s impact on the beverage industry and what it means for the future. This panel will be moderated by industry consultant, JB Shireman, and include thoughtful forward-thinking conversations for breweries of every size. Join this seminar for an overview of small business loan options generally available to breweries and, in particular, SBA loans, equipment financings, important loan terms to consider, and the logistical process of obtaining and using loans in a growing business. Sign-up for one-on-one consultations with experts in the craft beer industry! Experts in the following industries will be available: ABC trade practice, employee benefits, accounting, employment law and more! Separately Ticketed event. Free shuttles will transport attendees to and from the hotel and Societe Brewing. How has all the developments in the US beer and alcohol beverage market impacted the CA craft beer industry? Join three brewery owners for a candid discussion on the impact of craft’s shifting pace, and the latest data and news developments on the business of craft brewing. This keynote panel will discuss how the analyst's numbers impact real-life practices and decisions made on the ground by brewery owners every day. Jemma Wilson, Firestone Walker Brewing Co. This session will discuss a handful of the commonly observed safety practices in breweries that are not being done or are incorrectly/inadequately implemented. You may think your brewery has a stellar program but you will find out that several critical safety and regulatory requirements may be missing the mark. Learn from a panel of beer buyers in the on-premise space how to work your beer into the taproom line-up. Learn the processes and techniques Beachwood Brewing uses for its spirit barrel-aged beers, including recipe formulation & blending. While employers know they are obligated to quash any potential harassment by and among their employees, anti-harassment laws also prohibit harassment by and against third parties, including customers and vendors. Navigating and investigating harassment complaints involving third parties presents its own unique challenges. This solutions-focused session will examine harassment scenarios involving third parties and the relationships between a brewery and its customers and vendors to identify key steps all parties can take to address these types of reports and ensure a harassment-free environment. Join Tom McCormick & CCBA’s Government Affairs team for a conversation & Q&A session regarding CCBA legislation, current issues and the larger political environment at the State Capitol. This forum is a good opportunity to ask questions about current legislative bills, CCBA’s government affairs and advocacy process, why and how legislation is supported or opposed by the industry and the next step on multiple legislative efforts. The times are changing! Look closely at industry trends of the past few years—the proliferation of beer brands, the explosive growth of small breweries, the rise of hazy IPA, the changing demographics of craft beer drinkers—and weaving its way through it all, you'll find a newly-fashionable packaging format: the 16oz can. Sam Gilbert of Temescal Brewing will lead a panel of brewers and vendors at the heart of the recent small batch, one-off can craze in California. Together, they'll explore the shift in demand towards cans, the culture and marketing of 'hype cans', the benefits and challenges of canning as a small brewery, and the future of the trend. Entering into a beer distribution contract is like entering into a pre-nuptial agreement, you want to carefully negotiate the terms -- especially termination of contract -- before signing. This seminar will review key issues to address in a beer distribution contract, and creative ways that a brewery can negotiate less onerous termination provisions, preserve its ability to self-distribute, and otherwise maintain control over its beers. Breweries face many branding and marketing decisions that can impact their visibility, reputation, and growth. These decisions are also fraught with legal ramifications that must also be considered. Through a moderated discussion, a brewery representative, branding expert, and attorney will explore several contemporary issues, including those arising from pop culture/celebrity-influenced beer names; expanding your distribution into new regions; extending your brand to new products; and protecting elements beyond your brewery and beer names. What's going on in your kegs? Learn how to solve the mystery! In this presentation you will learn all about the D System, aka "American Sankey" keg valve - from guidance on safe repair and maintenance techniques, to tips on keg washer interface with D System valves, to overall quality assurance and customer satisfaction for your draft beer. Draft beer quality and customer satisfaction begins with your kegs. Every brewery that owns its kegs should have properly trained staff who know how to safely and effectively inspect and maintain them; kegs are a safe and robust container for beer – until they are not. Kegs require attention and service to keep providing top quality draft beer for your customers.